Old houses can have a lot of charm and beauty that makes them so appealing to many homebuyers, but age can also be the cause of a lot of problems. If you’re looking to remodel an older house, it can feel overwhelming to make repairs while staying true to the time period in which the house was built. Here are some steps you can take to begin your historical remodeling journey. Before you change anything, a good way to start is by taking inventory of all the issues you can find and then listing them in order of importance. This can help you determine where your money and effort is going to be the most concentrated. A plan can save you a lot of time, effort and money in the long run. After you have a list of things that need work, see if you can identify the different types of materials that were originally used. 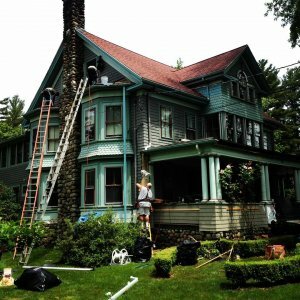 Some may not be so common in construction any more, but by going the extra mile to secure the same materials, you can help preserve some of the unique aspects in your historical remodeling project. If you need to replace certain parts of the building, a professional can help you determine the exact nature of the material and assist you in replacing it. If you can’t find an exact match, they should be able to help you find one that’s close. While you’re embarking on this project, you may find it useful to make a separate list of all the tasks you’ll have to complete regularly to maintain the house, like taking care of cracking paint. While it may be difficult to keep track of all the different materials and repairs in an old building, the experts at Boston Exterior Remodeling can be a huge help in saving and maintaining a historical remodeling project.